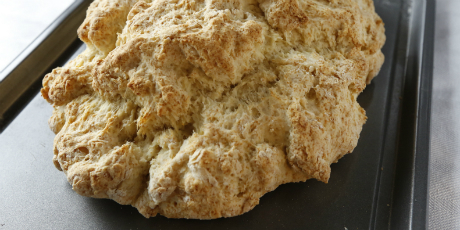 A Tofino, B.C., mother passes along this simple bannock recipe shared with her by an elder of the Nuu-chah-nulth culture she cherishes. You might also like these Tasty Canadian Indigenous Restaurants. 1. In large bowl, mix together flour, baking powder, milk and oil. Stir until dough comes together in a ball; do not overmix. Shape into rough oval; place on baking sheet or oven-safe casserole dish. 2. Bake in 400°F (200°C) oven “until a beautiful golden brown,” about 30 minutes. 3. Serve warm or cooled. Excellent with B.C. blackberry jam. Courtesy of Marnie Helliwell, via Grace George, Tofino, B.C.